Yes, that’s a professor who is fighting crime. 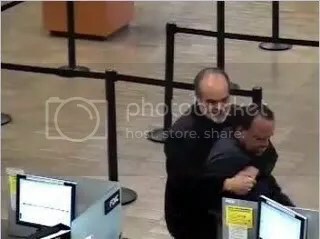 Journalism professor Kim Komenich, who teaches at San Jose State, caught a perp in a bear hug before he could rob a bank. Kudos to you, professor, for doing us all a favor and proving that, yes, professors do much more than drone on about obscure matters. In their off-hours, they fight crime! Crime-in-progress/perp photos wind up released to the masses courtesy of the police department. All charges against the person in the bear hug are alleged until proven under law. Subscribe to comments with RSS	or TrackBack to 'Breaking the Academic Stereotype: Professor as Crimefighter, Asskicker'. He looks like Sean Connery — swoon! Why stop at bank robbers? He’d really be a crimefighter if he could “bear hug” bank execs and shady investments types into submission.